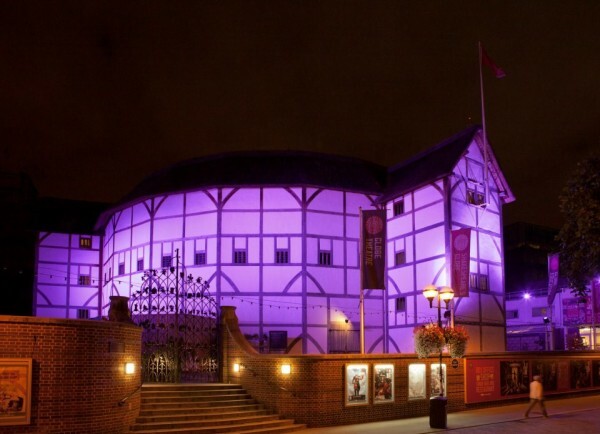 This week I have decided to feature one of my favourite London theatres – Shakespeare’s Globe. The Globe is a very special theatre and a very special performance space for a number of reasons. Shakespeare’s Globe is a faithful reconstruction of the Globe Theatre, an open air playhouse first built in 1599, where Shakespeare worked and for which he wrote many of his greatest plays. It is located on Bankside in the London Borough of Southwark, close to the site of the original theatre. It was founded by the actor and director Sam Wanamaker and opened to the public in 1997. The Globe is the closest recreation and reconstruction of the theatre as it was in Shakespeare’s day, based on the best available and most painstaking research. Its reconstruction was carefully researched so that the new building was as faithful as possible to the original building on the Bankside site. Like the original Globe, the modern theatre has a thrust stage that projects into a large circular yard (the pit), surrounded by three tiers of raked seating. The seats are simple benches. The pit, where the “groundlings” stand, has a concrete surface. The Globe has the only thatched roof allowed in London since the Great Fire of 1666. Plays are staged during the summer, typically between April and October. More than any other theatre I have ever been to, either in the UK or abroad, the Globe has the most interaction between the actors on stage and its audience. This is something the Globe cultivates and celebrates. Many of the actors who have played at the Globe have commented on how the audience is an integral part of the show. An actor can see the audience, and their faces and their reactions. This makes for a different theatre experience for both actors and audience; markedly difference from any other London theatre. The interaction between the audience and the players makes the Globe special; it gives the place a real buzz and an energy that you simply do not get at other theatres. The Globe attracts a very diverse audience. Young and old; Londoners and tourists; UK and international; all ethnicities, faiths, sexualities and nationalities; theatre buffs and people trying out theatre for the first time. This gives the theatre an energy and a vibe that does not occur elsewhere. The Globe is an open air theatre (it has no roof) which creates a very special feeling as night falls during an evening performance. You go from perfect light, to near dark, where the lighting takes over. To have the sky and the stars above you makes for a unique and special experience. And if it rains, or snows, that makes for a completely different experience, especially for the groundlings! You can have the best seats in the House at the Globe for £5. These are the standing tickets (“groundlings”) in the yard. They have the best views because you are closest to the action and you can follow the action around the stage, and this section has by far and away the most interaction with the actors on the stage. For the last few years, I have only ever bought groundling tickets for shows at the Globe. If you think the Globe only does “traditional” Shakespeare, you might be surprised by two things. First, the Globe does perform Shakespeare in Renaissance costumes and with Renaissance staging, but it also does modern Shakespeare adaptations, with modern costumes and modern staging. Second, the Globe stages new plays every Season. For example, one of the best new plays I saw this year was Blue Stockings at the Globe; a new play by Jessica Swale about women university students at Girton College, Cambridge in the 1890s and the fight to allow them to graduate. It is perfectly possible to see both modern Shakespeare adaptations and new plays at the Globe. Also on the same site is the Globe exhibition, which is open all year round. The Globe exhibition explores the life of Shakespeare, the London where he lived and worked, and the theatre for which he wrote. It looks at the Globe as it would have been – the centre of what was once London’s most notorious entertainment district, surrounded by raucous taverns and bawdy-houses. When you visit the exhibition, a tour of the theatre is included, and the theatre tours run all year. I have been to the exhibition and on the theatre tour and I am happy to recommend both – they are fascinating and very good value-for-money. The Globe have recently announced their 2014 Season which will commemorate two significant anniversaries – the 450th anniversary of Shakespeare’s birth and the centenary of the First World War. The 2014 Globe Season is entitled “Arms and the Man” and will include productions of Shakespeare’s Julius Caesar, Antony and Cleopatra, Titus Andronicus, The Comedy of Errors, Hamlet, King Lear, A Midsummer Night’s Dream and Much Ado about Nothing. The Season will also feature four new plays – Doctor Scroggy’s War by Howard Brenton, Holy Warriors by David Eldridge, The Last Days of Troy by Simon Armitage, and Pitcairn by Richard Bean. Finally, I would like to mention a very exciting new development at the Globe. In January 2014 the new indoor theatre, named the Sam Wanamaker Playhouse after the founder of the Globe, will be opening its doors. The new indoor theatre will mean the Globe can stay open throughout the year. The Sam Wanamaker Playhouse will be like no other, with an oak structure, pit seating and exquisite carvings adorning it – and during performances it will be lit by candles. It will start by exploring the plays of that period written specifically for indoor theatre and the opening season includes The Duchess of Malfi, The Knight of the Burning Pestle and The Malcontent. I am really looking forward to seeing the new Sam Wanamaker Playhouse and I already have my tickets booked for its first Season. In a nutshell, I believe the atmosphere at Shakespeare’s Globe is markedly different from any other London theatre. This is down to its audience and the players, and the way they interact with the audience. If you have never been there, I highly recommend a trip there to see one of the shows in the 2014 Season.